As the foremost developed nation, the US boasts the largest economy globally. It is the country’s service sector that by far drives the US economy and accounts for up to 75% of the total annual output. Manufacturing comes second with 23% followed distantly by agriculture at a mere 2%. As an industrialized nation, the US mainly produces finished industrial products. In the past, it relied on the sale of machinery, automobiles, and consumer products. Only recently has it focused more on technological output such as mobile phones among other communication devices and computer software. The country is a major importer of raw materials mainly to power its vibrant industrial sector. Some of its major trade partners include the EU, China, and Japan from which it imports and exports a wide range of products. The US attracts great admiration from its peers in the international scene for its superior production output and relative stability. However, this has not always been the case. The country has experienced its fair share of adverse economic volatility such as the 2008 global recession and economic crisis. In turn, such effects have had far reaching consequences by manifesting in other domestic economies globally. This factor alone points to the economic superiority of the US on the international scene. It is the ability to recover from economic turmoil that positions the US as the most developed and stable economy in terms of real GDP, labor market, and inflation aspects. In economics, the real GDP denotes the total value of production in a given economic entity. This metric captures the value of goods and services realized in a given economy in the span of one year. Furthermore, economics also seeks to describe the expansion of this output level in subsequent years. In this regard, it has the real GDP growth rate to signal growth of the total output from one year to the next. Finally, there is the real GDP per capita. In essence, this is the total output in a country divided by the population. The metric seeks to paint a picture of what individual output would translates to when all individuals record uniform production output within a year (DHANARAJ, GOPALASWAMY, and SURESH, 2013). The real GDP growth rate exhibited a steady growth rate at the turn of the century with a 4.1% growth rate in 2000. It performed dismally in the subsequent year at a measly 1% perhaps due to the global skepticism about the computer bubble at the turn of the century. However, it did recover and recorded an increase of 1.8% in 2002 before attaining its peak of 3.8% by the year 2004. From his point, the economy went on a negative growth rate with the onset of the global recession culminating in deceleration or negative growth of 2.9% in 2009 (KUMAR, 2015). 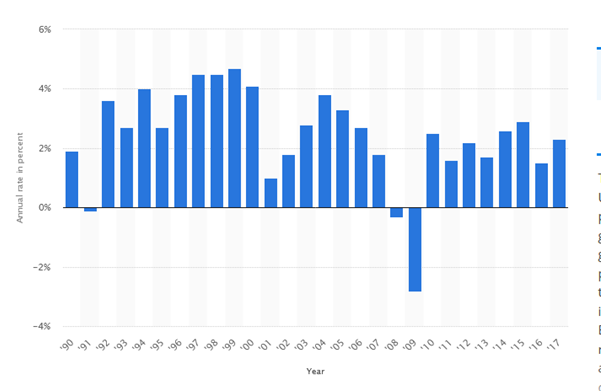 The US government then embarked upon a fiscal expansionary policy afterward which saw the country maintain an average 2% annual real GDP growth. By 2014, the country recorded an upwards of 2.4% real GDP growth rate implying that it was out of the woods in terms of the recession. It has maintained this level ever since pointing to the fact that the US economy is now ready for a takeoff. In the last decade, the major challenge bedeviling the US economy has been the recession. During such times, individuals and households tend to hold on to the resources available at their disposal. This way, the demand in the economy decreases, which increases the intensity of the recession. In response, the US government embarked upon an expansionary fiscal policy (THEODORE et al, 2015). It sought to inject more resources in the economy in a bid to jumpstart the demand. This strategy worked perfectly well and is the main reason the country overcame the greatest recession of the new millennium. The US authorities specifically pinpointed military spending and rescuing financial institutions as the avenues for restoring demand. With the recession emanating from unsecured house loans, the best way forward was to extend loans to banks among other financial institutions. The reasoning was to keep the institutions operational as they kept up with the pressure of deposit withdrawals and recurrent losses. Recently, the country has been on an upwards projectile and records an average 2% annual growth rate in the real GDP (BHATIA, 2017). This might seem minute, but not so once juxtaposed side to side by developing countries. The country has been on an expansionary phase and it is only a matter of time before it strikes boom with peak economic performance. By definition, unemployment refers to disengaged willing and qualified labor in the market. It denotes the percentage of qualified individuals without meaningful income generating activities. The ten year period leading up to 2014 reveals a volatile unemployment rate. Towards the end of the last century, the unemployment rate was on a steady decline. Perhaps this was in relation to the strong US economic performance at that time. The rate recorded sharp increase at the onset of the global recession in 2008. It attained the peak levels at an estimated 9% in 2010 (GLOBERMAN, 2014). During this time, most workers lost their jobs as companies went on downsizing strategies to keep up with the biting recession. After 2011, with appropriate government fiscal policies, the rates have been on a steady decline. This culminated in slightly over 4% in 2017 which signaled the country’s recovery trends. Structural unemployment: in this scenario, workers get displaced from their current position by market factors. This happens when new skills set or best practices emerge in the market. Workers without these emergent qualifications slowly become redundant and lose employment positions in their organizations (KOLESNIKOV et al, 2016). Cyclical unemployment: sometimes demand decreases in the market forcing companies to downsize operations. In this regard, they have to lay off workers in keeping up with the developments in the market. Long term unemployment: this occurs when qualified and willing workers search for but fail to secure employment opportunities in a period exceeding six months. The Trump administration has expressed outright its intention to revive the US economy after taking over from President Obama. From the electioneering period, it stated that its intention was to “make America great again“. The current administration derives motivation from massive economic progress realized towards the end of the 20th century. In essence, it wants to reverse the gains made towards globalizing the American economy, which has negatively affected employment rates in the country. In the recent years, US companies have increasingly gained notoriety for outsourcing production to Chinese manufacturers all in efforts to minimize production costs (GROS and ALCIDI, 2010). As a developing country, China has low wage rates as compared to industrialized nations in Europe and North America. What is more, it boasts advanced technological progress that is at par with the developed nations across the world. This makes it an attractive destination for outsourced production processes since it guarantees low production overheads. It is for this reason that US companies have been outsourcing production to their Chinese counterparts all in efforts to minimize production costs. Upon its inauguration, the Trump administration pledged to lock the US economy from unfair external participants. The country now seeks to do away with the outsourcing efforts since this translates in job losses to the Chinese. It wants to see a situation where companies engage in domestic production so as to create jobs for the local US citizens. Afterwards, companies will be free to offload finished products in the external or foreign markets (BHATIA, 2017). Similarly, it charges higher taxes for Chinese among other foreign imports all in efforts to protect its struggling domestic industries. The motive is to preserve the positions for workers in such industries. Analysts are of the opinion that the US needs to do away with stringent measures governing the corporate sector. As it stands, entrepreneurs have to fulfill myriads of requirements before setting up shop. 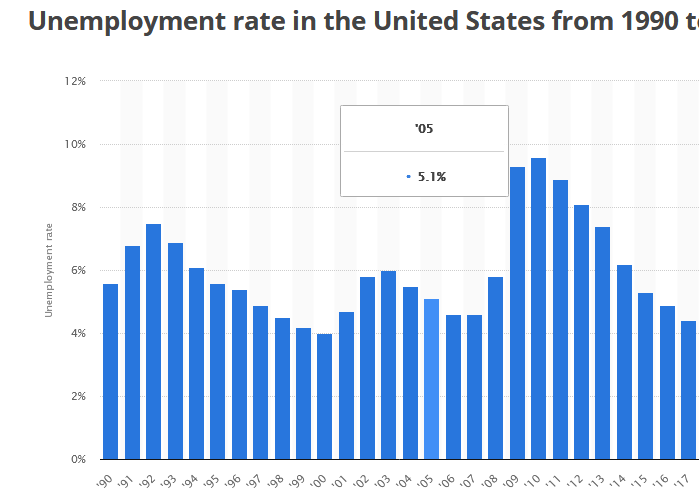 Whereas this has defined the US economic scene for decades, it does not augur well for the creation of new companies and subsequently employment opportunities. The US government needs to make it easy for entrepreneurs to venture into the market to capitalize on identified opportunities (THEODORE et al, 2015). This way, it becomes much easier to create more and more employment opportunities in the recovering economy to eliminate the rising unemployment rates. Inflation refers to a scenario where there is a general increase in price levels in an economy. 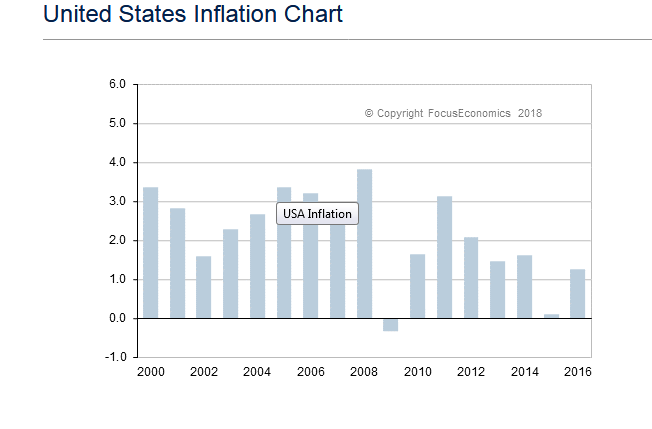 The US has always maintained a low inflation rate, but just the appropriate rate to keep the economy going. The high economic performance of the 1990s meant that the country recorded higher inflation rates. There can be no increased demand without rising inflation. At the onset of the global recession in 2008, the inflation rate decreased to a negative value due decreased demand general expenditure in the market (WOLNICKI, 2009). However, government expansion fiscal policies to tackle recession restored demand to its previous levels and consequently higher inflation rates. As mentioned, inflation stems from expansionary fiscal policy which can occur in two ways. First, the regulatory authorities could choose to increase government spending in the economy to tackle decreased demand. In turn, this increases the level of aggregate demand which translates in a rise in the general price level (KURECIC, 2015). On the other hand, central bank could choose to increase money supply in the market when it detects low amounts of currency in circulation. In the end, such a policy will increase the money circulating in the economy eventually causing inflation. Despite the government efforts to keep the economy in check, it failed to moderate price levels. The strong US dollar meant that imports became much cheaper. This in turn caused an influx of imports which negatively affected the real GDP and prices for domestic products. The price levels during the period decreased by 1.4% (BHATIA, 2017). This resulted mainly from an increase in the prices of energy and food during that period. The low price levels consequently increased consumer purchase power by up to 3.2%. Consumers were able afford more product as a result of the decreasing price levels. This ranked among the factors that triggered an increase in demand towards 2014 as more and more individual and household consumers went ahead to spend in the economy. In retaliation, the government opted to offload more dollars in reserve to attain price stability. This increased the amount of dollars in circulation so as to counter the negative effects of high importation. 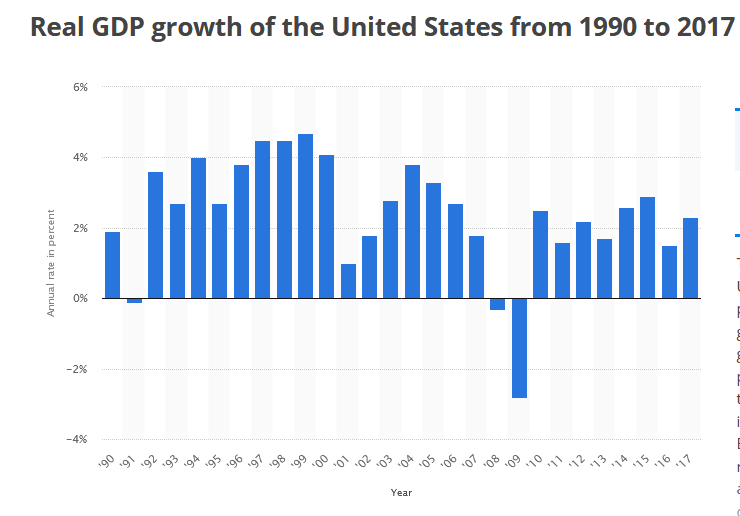 The US recorded fantastic growth all across the 1990s with an ever expanding economy. However, it recorded a slight decline at the turn of the century perhaps due to the country’s focus on Afghanistan and Iraq wars. Afterward, it went back to the expansion phase until the onset of the global recession and financial crisis. This kicked off in earnest in 2008 and took almost four years to overcome (NAIM, 2017). This global recession emanated from the bubble in the housing market and went on to replicate in other parts of the world. Even countries and economic systems that had very little to do with the US economy, sooner or later collapsed under the expanding global recession. This goes to show the status of the US economy globally. As the leading economic entity, the US determines the pace of international economic growth and slow-down in manner that no other single domestic entity can. The lowest point was in the beginning of the2009/2010 financial year when it decelerated to an all time low (THEODORE et al, 2015). During this period, the US economy recorded negative growth of up to 5%. What this means is that the economy contracted by 5% which translated in loss of overall output and employment rates. The US economy turns out to be the most developed globally due to various reasons. The country pays close attention to the dynamics defining its overall performance. In case of malfunctions, it takes adequate measures to ensure the resultant impacts do not spread to the other areas. As a result, it has claimed global dominance and will continue on this trend even into the future. The country needs to keep a close eye on factors such as GDP, labor, and inflation which could upon its overall performance. BHATIA, A., 2017. Can Financial Variables Predict Recessions? A Study of U.S.A. and India. Economic Affairs, 62(3), pp. 503-530. DHANARAJ, S., GOPALASWAMY, A.K. and SURESH, B.M., 2013. Dynamic interdependence between US and Asian markets: an empirical study. Journal of Financial Economic Policy, 5(2), pp. 220-237. GLOBERMAN, S., 2014. Regulation and the international competitiveness of US-based companies. Competitiveness Review, 24(5), pp. 378-392. GROS, D. and ALCIDI, C., 2010. The impact of the financial crisis on the real economy. Intereconomics, 45(1), pp. 4-20. KOLESNIKOV, Y.A., EPIFANOVA, T.V., USENKO, A.M., PARSHINA, E. and OSTROVSKAYA, V.N., 2016. The Peculiarities of State Regulation of Innovation Activities of Enterprises in the Global Economy. Contemporary Economics, 10(4), pp. 343-352. KUMAR, M., 2015. Inter-linkages between India and World Stock Markets and European Debt Crisis. Journal of Commerce and Accounting Research, 4(3), pp. 47-59. KURECIC, P., 2015. GEOECONOMIC AND GEOPOLITICAL CONFLICTS: OUTCOMES OF THE GEOPOLITICAL ECONOMY IN A CONTEMPORARY WORLD. World Review of Political Economy, 6(4), pp. 522-543. NAIM, N., 2017. Transatlantic trade and investment partnership (TTIP) and the spill overs effects on the Gulf – cooperation council. International Journal of Law and Management, 59(1), pp. 35-51. THEODORE, N., BLAAUW, D., SCHENCK, C., VALENZUELA JR., A., SCHOEMAN, C. and MELÉNDEZ, E., 2015. Day labor, informality and vulnerability in South Africa and the United States. International Journal of Manpower, 36(6), pp. 807-823. WOLNICKI, M., 2009. The post-conservative orphan: why the USA needs an effective government economic policy. International Journal of Social Economics, 36(1), pp. 5-22.